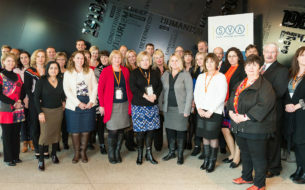 Last month, school leaders from the SVA Bright Spots Schools Connection came together at The Bastow Institute of Educational Leadership in Melbourne. The occasion was the second quarterly Thought Leadership Gathering that networks The Connection cohort school leaders. The topic for this two-day gathering was ‘Community Partnerships’. After an initial session where the school leaders communicated the journeys of their schools’ progress, Jan Owen AM, CEO of the Foundation for Young Australians (FYA) led a workshop on achieving successful community partnerships. Jan’s wealth of experience in leading youth-centred partnerships offered insights into both the common shortcomings and successes of partnerships. The overall takeaway was that schools must be highly selective with their partnership choices. While partnering has the ability to leverage outcomes for schools, it can also have the opposite effect. Time is the most finite resource for teachers and students, and partnerships can demand a lot of time. Jan pointed to the importance of co-design during the partnership development phase. While co-design between the school and the partner requires significant front-end investment, it helps ensure commitment to the sustainability of the partnership in the long-term. Day two was facilitated by Dr Michelle Anderson, an expert specialising in philanthropy and education. The sessions challenged the school leaders to overlay a more directed framework to their partnership choices, which relates to their school goals. Michelle provided examples such as crowd funding for school projects, housing partnerships for community development, and school-to-work initiatives. This was followed by a Q&A panel discussion with Anton Leschen from the Smith Family, Val Ridley from the Beacon Foundation, Russell Kerr from Hands on Learning, and Michelle Hamilton from Schools Connect Australia. The panel shared insights from their experiences with school to community partnerships and reinforced that student outcomes must ultimately be at the centre of all partnerships. As a final activity, the school leaders worked in groups to enhance their current partnerships, or develop new ones, that will help achieve their school goals. The Thought Leadership Gathering challenged perceptions of community partnerships and strategies to enhance their efficacy. We hope that this two-day event will seed ideas and greater rigour around community partnerships for The Connection schools.